I am Niels Grobbe, my nationality is Dutch. I have been fascinated by nature and planet Earth since my first baby steps. Therefore, I am very happy to be a geophysicist, to be able to see what additional beauty lies beneath the Earth’s surface, and to discover and sustainably use the crucial economic resources (fresh groundwater, geothermal, hydrocarbons, ...) that are hidden below our feet. At the same time, non-destructive imaging and characterization of the Earth's subsurface helps us to better understand some of Mother Earth's fundamental processes that have formed and shaped our current planet and will determine our future. I am highly interested in trying to understand the Earth's (and other planet's) volcanological processes in all their complexity, including volcanic hazard assessment, and I have a particular interest in the interactions between groundwater and volcanism. My B.Sc. degree (Earth Sciences) and M.Sc. degree (Geophysics) both originate from Utrecht University (the Netherlands). 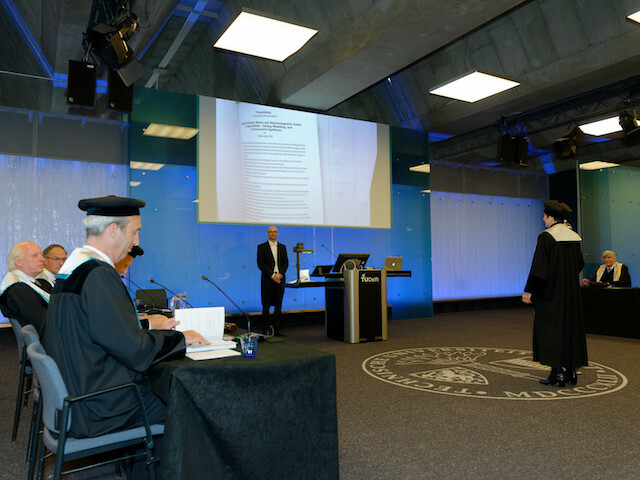 I have obtained my Ph.D. degree in (Applied) Geophysics from Delft University of Technology (the Netherlands). In my Ph.D. research, I have studied coupled seismo-electromagnetic phenomena, a fascinating topic where the physics of porous media, seismics (poroelasticity), electromagnetics, and rock physics all come together! In September 2015, I joined Aramco Overseas Company B.V. as a Research Geophysicist. As much as I liked the team and the company, I discovered that my dream is to pursue an academic career, and I decided to follow my dreams. 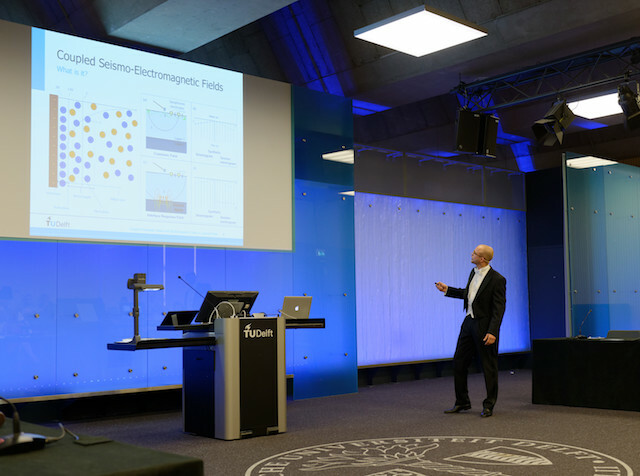 I followed-up as a postdoctoral researcher in Geophysics at Delft University of Technology. From October 1, 2016 until the end of October 2017, I was a postdoctoral associate at MIT, holding a joint position in the MIT Mathematics department and in the Earth Resources Laboratory (ERL). In this role, I have been primarily working on the physics of porous media, and the geophysical characterization of these complex media using different geophysical methods and data types. I particularly focused on increasing our understanding of pore pressure and pore pressure anomalies in the subsurface. Currently (having started this role on November 1, 2017), I am a tenure-track Assistant Researcher faculty member in Hydrogeophysics and Geophysics at the University of Hawai‘i at Mānoa. I hold a joint-position at the Hawai‘i Institute of Geophysics and Planetology (HIGP) and the Water Resources Research Center. For now, I hope you will enjoy exploring this website. If you have any questions or remarks, please do not hesitate to contact me. See you again soon, on this webpage or in real life! All the best! Niels. Electromagnetic methods for Volcanic Characterization. 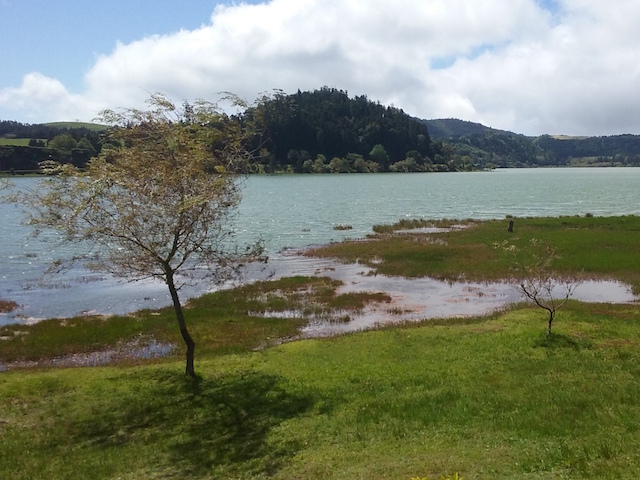 Lake Furnas: so serene and beautiful. 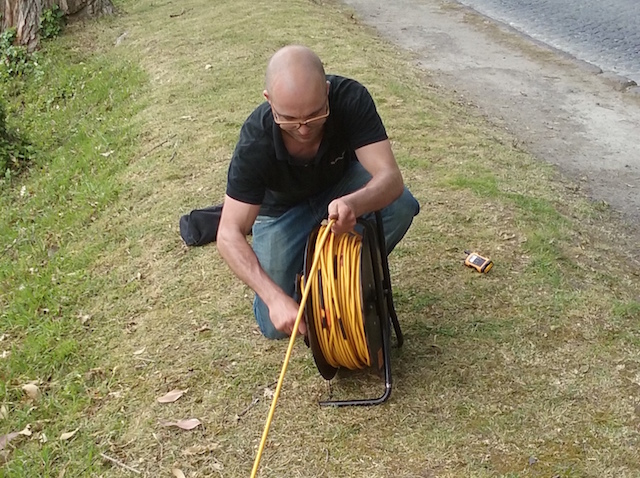 ERT fieldwork: it's all about rolling and unrolling the cables. Acquiring correct GPS coordinates is crucial. 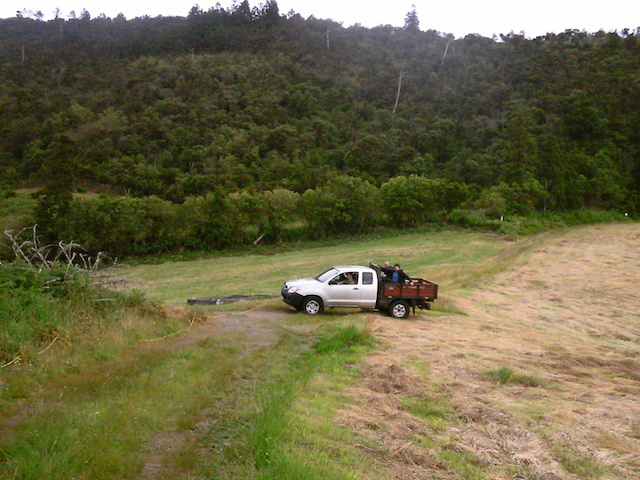 A 4-wheel drive truck is always handy on the dome :). Acquisition is running: some time to relax. PhD defense about to start. Accompanied by the pedel. Hora est! Niels Grobbe's PhD defense is over. 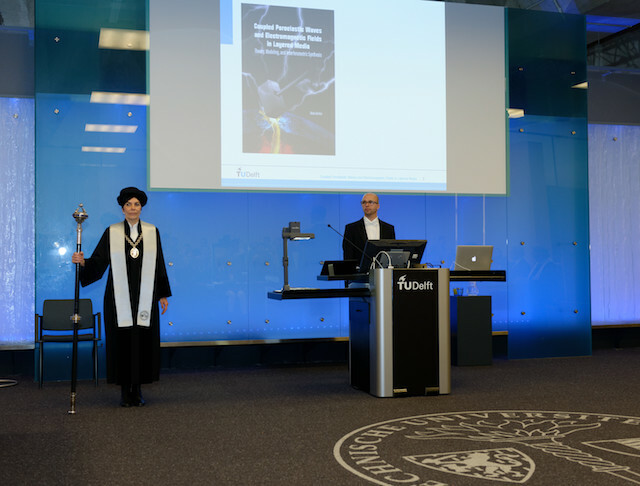 Niels Grobbe being awarded his doctoral degree. Seismoelectric wave propagation movie, generated using ESSEMOD, showing the (amplitude normalized) P- and S- wave related coseismic fields propagating through a model containing a single layer embedded between two halfspaces. When the coseismic fields hit the interfaces, conversion takes place generating the seismoelectric interface response fields. The interface response fields are clearly visible when focusing on the S-waves, due to the source-receiver combination under consideration. The recorded fields are electric fields in the x1-direction due to a seismic dipole bulk force source in the same direction. 1. Coupling at the source: the impact of the seismic source generates directly an independent EM field, arriving more or less at t=0 [s] on a seismic time scale. 2. Coupling due to wave propagation: the seismic wave introduces pore-fluid movement relative to the movement of the grains, generating a local EM field that copropagates within the seismic wave: the coseismic field. This EM field can only provide us with local information, at the location of the measurements. 3. Coupling at heterogeneities / interfaces: a second-order coupling effect due to asymmetry in the charge distribution, generating an independent EM field arriving more or less instantaneously at one-way seismic time, i.e. the seismic time from the source to the heterogeneity. See (Figure 1) for a schematic overview of these three stages of coupling. ESSEMOD - Electromagneto-Seismic and Seismo-Electromagnetic Layered-Earth Modeling code developed in a combined Fortran/C language, compatible with the Seismic Unix interface. 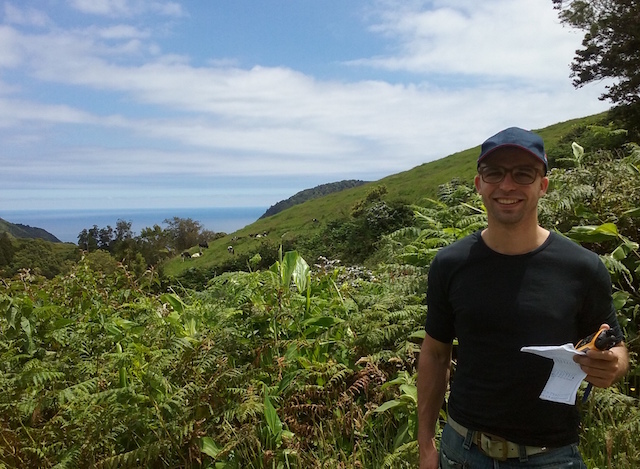 In the summer of 2016, I was an invited scientist on an international field campaign on the Azores for electromagnetic volcanic hydrothermal characterization. 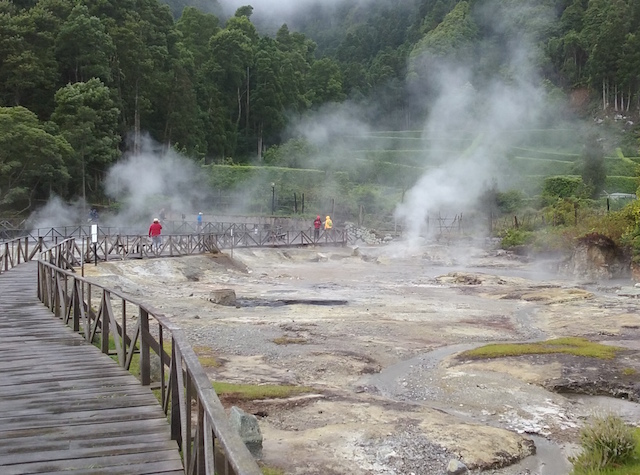 We have combined magnetotelluric, induced polarization, electrical resistivity and self potential data with geochemical measurements from the fumarolic area, to better understand the extend and evolution of hydrothermal systems and its impact on the health of the people living on the Azores volcanic island group. ‘Ike Wai means in Hawaiian: Knowledge of Water, and that is what this massive multi-disciplinary project is all about. Hawai‘i is 100% dependent on its own fresh water resources. This project aims to obtain an improved, highly detailed understanding of Hawai‘i’s subsurface groundwater-controlling structures, flow paths, aquifer connectivity, and submarine groundwater discharge, with the aim to be able to inform Hawai‘i's water management on sustainable water usage and development. For more information:click here. Support for the Hawai‘i EPSCoR Program is provided by the National Science Foundation’s Research Infrastructure Improvement Award (RII) Track-1: ‘Ike Wai: Securing Hawaii’s Water Future Award # OIA-1557349. CSG Het Streek, The Netherlands. Tenure-track Assistant Researcher Faculty, Hawai‘i Institute of Geophysics and Planetology (HIGP) and Water Resources Research Center (WRRC), University of Hawai‘i at Mānoa, Honolulu, HI, United States of America. 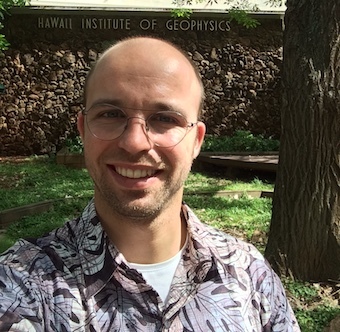 I am a tenure-track Assistant Researcher Faculty Member in Hydrogeophysics and Geophysics, at the Hawai‘i Insitute of Geophysics and Planetology and the Water Resources Research Center of the University of Hawai‘i at Mānoa. Postdoctoral Associate, Mathematics Department and Earth Resources Laboratory (ERL), Massachusetts Institute of Technology (MIT), Cambridge, MA, United States of America. Prof. Laurent Demanet, in the Mathematics department of MIT. My key focus areas are: the physics of porous media (incl. pore-pressure anomalies), multi-physics approaches, imaging, characterization, and inversion. Delft University of Technology, Department of Geoscience & Engineering, Section of Applied Geophysics & Petrophysics, Delft, The Netherlands. Research Geophysicist at Aramco Overseas Company B.V., Global Research Centre Delft, The Netherlands. During my time at Aramco, I have successfully passed my probation period. I have acquired amazing technological skills and I have gained a lot of additional insight into the oil- and gas industry, their challenges and demands, the way their systems work, their short- and long-term research visions, and their current core research interests. Additionally, it further strengthened my team-working skills. However, I also discovered that my dream is to pursue an academic career. Therefore, I decided to leave this wonderful company, to fully focus on my academic career. Associate Editor GEOPHYSICS, section: Interdisciplinary Studies. Guest-Editor SEG, GEOPHYSICS special section: Shared advances in exploration and fundamental geophysics. JpGU Annual Meeting, Chiba-city, Japan. AGU Fall Meeting, San Francisco, USA. Reviewer of GJI (Geophysical Journal International), GEOPHYSICS, JGR Solid Earth (Journal of Geophysical Research) journal papers, and EAGE and SEG annual meeting extended abstracts. Paper title: `Seismoelectric interface response signal behaviour in thin-bed geological settings'. See photo 1 and photo 2 for an impression of the award ceremony as being held at the SEG 2015 Annual Meeting in New Orleans, and photo 3 for the personal recognition by the Aramco Overseas Company B.V. Managing Director. 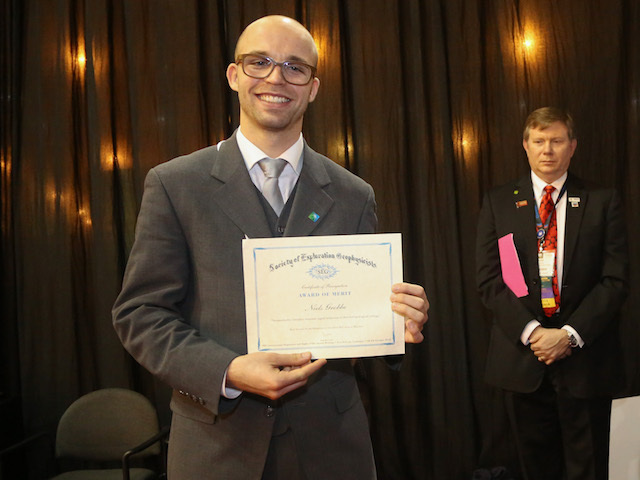 SEG AM 2015 New Orleans: Niels Grobbe being awarded the 'Award of Merit for Best Student Paper' presented at the SEG 2014 Annual Meeting in Denver. 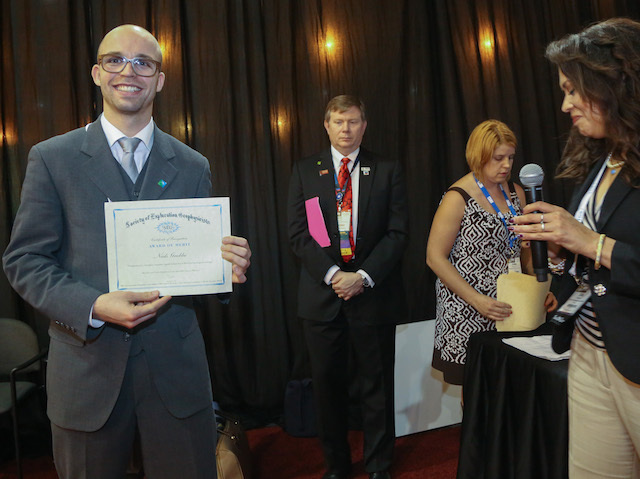 SEG AM 2015 New Orleans: Niels Grobbe receiving his 'Award of Merit for Best Student Paper' presented at the SEG 2014 Annual Meeting in Denver. 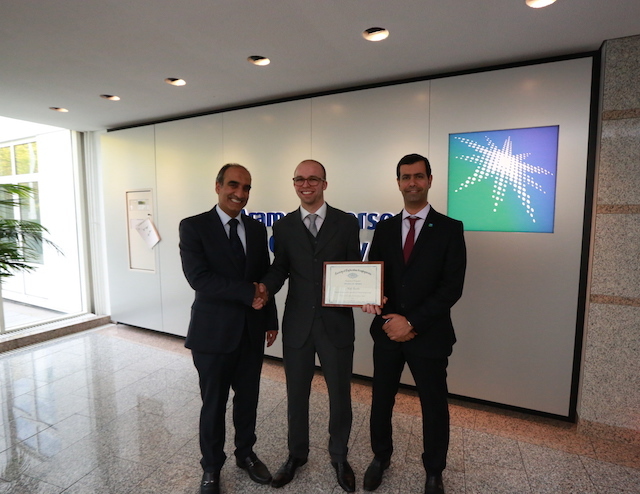 Niels Grobbe receiving recognition by the Aramco Overseas Company B.V. Managing Director, for winning an SEG award. SEG (Society of Exploration Geophysicists) / Chevron Student Leadership Symposium (SLS) Travel GrantLas Vegas, USA. Since 2016, I am a committee member of the EAGE Young Professional Community YP-SIC. The mission of the EAGE YP Community is to enable EAGE Young Professionals to offer mutual support and the exchange of information relating to: better understanding of YP community expectations, facilitation of advice given between community members, sharing of career opportunities, guidance on career development. Each year at the EAGE Annual Conference and Exhibition. Click here for a video impression of the Young Professional Session at the 2016 meeting in Vienna. Secretary and Member of the Central Works Council of FOM (Dutch Foundation for Fundamental Research on Matter). PhD representative Department Meetings, Delft University of Technology. President (2012-2013) and Treasurer (2010-2012) of the SEG student chapter D.O.G.S. (Delft Organization of Geophysics Students). University of Hawai‘i aMānoa, HIGP and WRRC. The ‘Ike Wai project aims to obtain an improved, highly detailed understanding of Hawai‘i’s subsurface groundwater-controlling structures, flow paths, aquifer connectivity, and submarine groundwater discharge, with the aim to be able to inform Hawai‘i's water management on sustainable water usage and development. Hawai‘i is 100% dependent on its own fresh water resources, so well-informed management decisions are crucial for the future of Hawai‘i and its inhabitants. ‘Ike Wai means in Hawaiian: Knowledge of Water, and that’s what this massive multi-disciplinary NSF EPSCoR project is all about. University of Hawai‘i at Mānoa, HIGP and WRRC. Delft University of Technology, M.Sc.thesis . Abstract: In the field of exploration geophysics various methods are applied to determine the physical properties of the subsurface of the Earth. Some of the methods most widely used are seismic and electromagnetic surveys, which are each used according to the type of information that is being sought and their ability to provide that information. 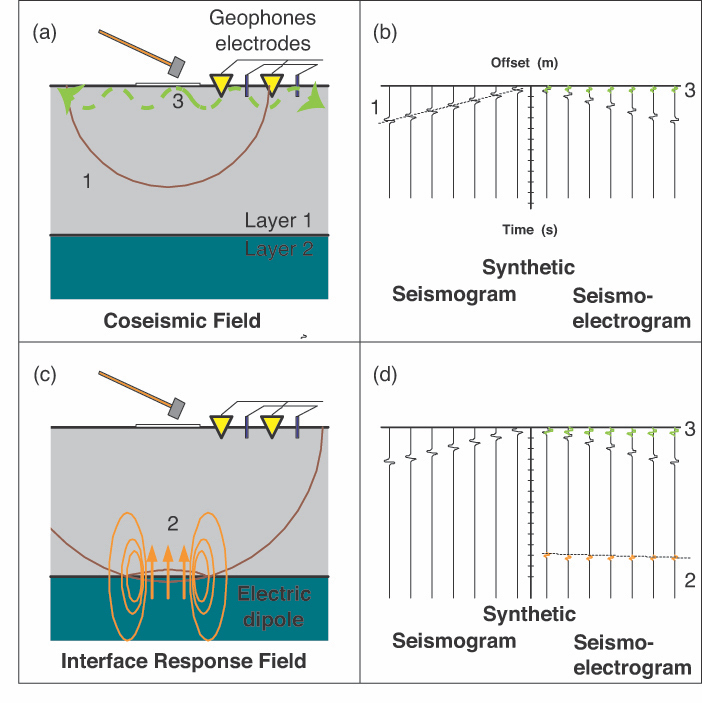 The method of seismoelectrics is in that regard a promising technique because theoretically it should be sensitive to a wide range of subsurface parameters, spanning both the acoustic and the electromagnetic methods. We aim to perform a parameter sensitivity analysis for the seismoelectric problem, investigating how perturbations in different parameters affect the data and how well these perturbations can be inverted for. We will first study some elements of inverse theory with a special focus on how to construct resolution functions from the basic integral equation of scattering theory. This integral equation can be derived using both superposition and reciprocity principles. This will be shown for both the electromagnetic and the acoustic case, before moving on to the seismoelectric case; it will become clear that the latter poses additional challenges. In addition, the results for the electromagnetic case can be compared directly with the results obtained by [Slob and Mulder, 2011] who performed an electromagnetic parameter sensitivity analysis. The results of this comparison could serve as a validation of the seismoelectric forward modelling code ESSEMOD [Grobbe and Slob, 2013], which will be used to generate synthetic data for this thesis. It is concluded that the superposition principle and the reciprocity theorem provide identical expressions for a scattered field. This conclusion was the basis for deriving the complete reciprocity theorem for the seismoelectric system, which was in turn used to derive resolution functions for a perturbation in bulk density and a perturbation in the seismoelectric coupling coefficient. For the electromagnetic case, we show that the resolution functions computed, using explicit analytical Green's function solutions are identical to resolution functions computed with data produced by ESSEMOD and that this indeed serves as a validation of ESSEMOD. Using the same approach, we have successfully computed a resolution function for inversion for the coupled seismoelectric system for a perturbation in bulk density. It is recommended that this innovative result is used as the basis for the analysis of the seismoelectric sensitivity to more complex parameter-contrasts, which could serve as an assessment of the true potential of the seismoelectric method. Abstract: Seismic and electromagnetic imaging methods both provide the geophysicist with different types of medium parameters. Seismic methods are sensitive to the elastic properties of the medium, while electromagnetic methods are sensitive to the electric properties. In porous-saturated media, these two wave fields occur as a coupled system, which is known as 'seismoelectrics'. This coupling is caused by physical interactions at the grain surface boundary and is a function of several medium parameters, such as dynamic permeability. This medium parameter is valuable to the oil and gas industry, as well to the field of hydrology. By conducting a seismoelectric survey it would theoretically be possible to provide an extra control on this medium parameter. However, both practice and theory have shown that this coupling mechanism also results in a low signal-to-noise ratio. A possible solution to this problem would be to apply interferometric Green's retrieval, which is a technique based on stacking of cross-correlated data. This approach has been proved successful for the SH-TE mode in 1D. The SH-TE mode forms together with the P-SV-TM mode, the total seismoelectric system. In this thesis the first steps are taken towards the proof that this technique could also work for the P-SV-TM mode of the system. This is supported by a modelling experiment of 2D homogeneous space solutions of the seismoelectric P-SV-TM mode for different configurations. This analysis turned out that the unwanted artefacts observed in the interferometric retrieval are generated by cross-correlations between P-waves and SV-waves. Abstract: Elastodynamic and electromagnetic processes are coupled together in saturated, porous media, by a phenomenon known as the electrokinetic effect. In horizontally layered media, the seismoelectric system, which contains the coupled elastodynamic and electromagnetic systems, can be separated into two independent modes of propagation: SH-TE and P-SV-TM. The SH-TE mode contains horizontally polarized shear waves coupled with transverse electric polarized electromagnetic waves. In the P-SV-TM mode, both fast and slow compressional waves are coupled with vertically polarized shear waves and transverse magnetic polarized electromagnetic waves. In this thesis, the P-SV-TM mode of the two-dimensional seismoelectric system was expressed in the form of both the two-way and one-way wave equations. The principle of normalizing energy flux across boundaries was applied, improving the matrix amplitude balance of the system and allowing for the implementation of one-way reciprocity theorems. We carried out full-waveform modelling of the flux-normalized P-SV-TM seismoelectric system in a 2-D fluid-saturated, horizontally-stratified, porous media. Both one-way and two-way wavefields were modelled, allowing the composition of one-way wavefields into two-way wavefields to be clearly observed. We investigated both the generation of electromagnetic fields due to the propagation of a seismic pertubation and the generation of seismic waves due to the propagation of a diffusive electromagnetic wave. Reciprocity of the wavefields was verified by applying reciprocity theorems to both one-way and two-way wave vectors. The electromagnetic field that is created when a seismic wave traverses a contrast in medium parameters is rapidly attenuated during propagation. To mitigate the decay in the amplitude of the signal with distance, we modelled a Vertical ElectroSeismic Profiling (VESP) survey, in which receivers could be placed in near proximity to the target layer. In another model, the sensitivity of the seismoelectric method to pore fluid contrasts was tested by simulating the influx of contaminants into an aquifer. It was observed that a small change in the conductivity of the aquifer led to a significant change in the strength of the electromagnetic signal that was generated at the top of the aquifer. 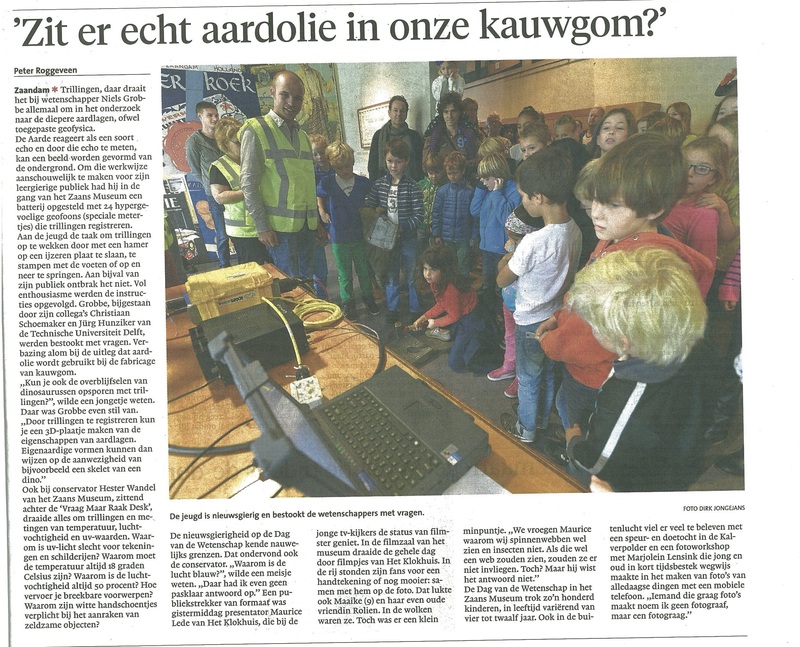 Niels Grobbe giving a workshop on Geophysics for primary school children in 'het Zaans Museum', Zaandam, the Netherlands. Filmed for the Dutch Children's Educational Television Program Het Klokhuis, for a session on the Earth and Geophysics ('Zoek het uit! Aarde'). Click here for the video (after 8:39 min). Soueid Ahmed, A., Revil, A., Byrdina, S., Coperey, A., Gailler, L., Grobbe, N., Viveiros, F., Silva, C., Jougnot, D., Ghorbani, A., Hogg, C., Kiyan, D., Rath, V., Heap, M.J., Grandis, H. and Humaida, H.
Journal of Volcanology and Geothermal Research, # p. 1-21. Abstract: Electrical conductivity tomography is a well-established galvanometric method for imaging the subsurface elec- trical conductivity distribution. We characterize the conductivity distribution of a set of volcanic structures that are different in terms of activity and morphology. For that purpose, we developed a large-scale inversion code named ECT-3D aimed at handling complex topographical effects like those encountered in volcanic areas. In ad- dition, ECT-3D offers the possibility of using as input data the two components of the electrical field recorded at independent stations. Without prior information, a Gauss-Newton method with roughness constraints is used to solve the inverse problem. The roughening operator used to impose constraints is computed on unstructured tetrahedral elements to map complex geometries. We first benchmark ECT-3D on two synthetic tests. A first test using the topography of Mt. St Helens volcano (Washington, USA) demonstrates that we can successfully recon- struct the electrical conductivity field of an edifice marked by a strong topography and strong variations in the resistivity distribution. 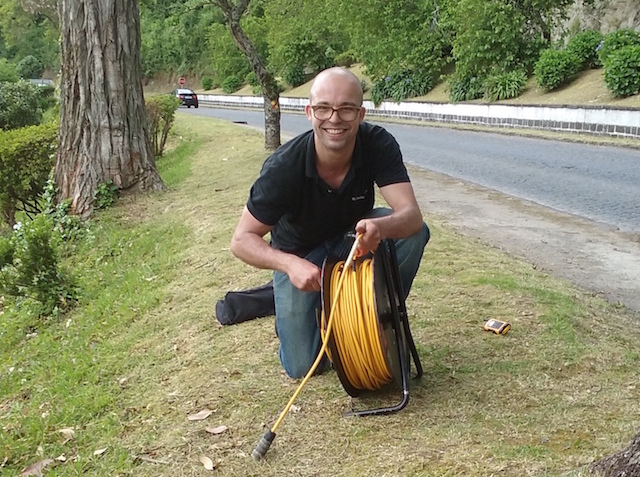 A second case study is used to demonstrate the versatility of the code in using the two components of the electrical field recorded on independent stations along the ground surface. Then, we apply our code to real data sets recorded at (i) a thermally active area of Yellowstone caldera (Wyoming, USA), (ii) a monogenetic dome on Furnas volcano (the Azores, Portugal), and (iii) the upper portion of the caldera of Kīlauea (Hawai'i, USA). The tomographies reveal some of the major structures of these volcanoes as well as identifying alteration associated with high surface conductivities. We also review the petrophysics underlying the interpretation of the electrical conductivity of fresh and altered volcanic rocks and molten rocks to show that electrical conductivity tomography cannot be used as a stand-alone technique due to the non-uniqueness in interpreting electrical conductivity tomograms. That said, new experimental data provide evidence regarding the strong role of alteration in the vicinity of preferential fluid flow paths including magmatic conduits and hydrothermal vents. De Ridder, S. Grobbe, N., Egbert, G., Fichtner, A., Keranen, K., Li, Y., Müller, T., Romanowicz, B.
Abstract: In the field of geophysics, a sharp distinction is often made between fundamental geophysics, focusing on understanding natural and physical phenomena, and exploration geophysics, focusing on applications for industry and society. But why would we draw this sharp line? Without doubt, researchers focusing on fundamental geophysics have greatly benefitted from advances in exploration geophysics, and vice versa. Our community is often segmented, living in parallel, not being aware of each other’s existence and accomplishments. Therefore, this special section focuses on shared advances in geophysics across scales and specializations. What are the shared advances, and what can we learn from each other? What cross-disciplinary collaborations are possible to further develop the field of science that we all love? This special issue covers a wide-variety of topics, including: • Seismology and seismics (e.g. noise-correlations, waveform inversion, or source characterization) • Rock physics (e.g. larger fault systems versus microcracks) • Gravity and Magnetics • Stress-mechanics (e.g. crustal scale versus reservoir scale) • Electromagnetics (e.g. magnetotellurics versus controlled-source electromagnetics) • Numerical modeling studies • Laboratory studies • Field data (e.g. advances in processing and imaging) In addition to this special section, dedicated sessions were organized at the AGU 2018 Fall Meeting in Washington D.C. showcasing a wide selection of research across scales and specializations. Grobbe, N., Slob, E.C. and Thorbecke, J.W. Geophysical Journal International, 206 p. 152-190. Abstract:We study the accuracy and numerical stability of three eigenvector sets for modelling the coupled poroelastic and electromagnetic layered-Earth response.We use a known eigenvector set, its flux-normalized version and a newly derived flux-normalized set. The new set is chosen such that the system is properly uncoupled when the coupling between the poroelastic and electromagnetic fields vanishes. We carry out two different numerical stability tests: the first test focuses on the internal system, eigenvector and eigenvalue consistency; the second test investigates the stability and preciseness of the flux-normalized systems by looking at identity relations. We find that the known set shows the largest deviation for both tests, whereas the new set performs best. In two additional numerical modelling experiments, these numerical inaccuracies are shown to generate numerical noise levels comparable to small signals, such as signals coming from the important interface conversion responses, especially when the coupling coefficient is small. When coupling vanishes completely, the known set does not produce proper results. The new set produces numerically stable and accurate results in all situations. We therefore strongly recommend to use this newly derived set for future layered- Earth seismo-electromagnetic modelling experiments. Seismo-electromagnetic thin-bed responses: Natural signal enhancements? Grobbe, N. and Slob, E.C. Journal of Geophysical Research - Solid Earth, 121 p. 2460-2479. Abstract:We study if nature can help us overcome the very low signal-to-noise ratio of seismo-electromagnetic converted fields by investigating the effects of thin-bed geological structures on the seismo-electromagnetic signal. To investigate the effects of bed thinning on the seismo-electromagnetic interference patterns, we numerically simulate seismo-electromagnetic wave propagation through horizontally layered media with different amounts and thicknesses of thin beds. We distinguish two limits of bed thickness. Below the upper limit, the package of thin beds starts acting like an “effective” medium. Below the lower limit, further thinning does not affect the seismo-electromagnetic interface response signal strength anymore. We demonstrate seismo-electromagnetic sensitivity to changes in medium parameters on a spatial scale much smaller than the seismic resolution. Increasing amounts of thin beds can cause the interface response signal strength to increase or decrease. Whether constructive or destructive interference occurs seems to be dependent on the seismo-electromagnetic coupling coefficient contrasts. When the combined result of the contrast, between upper half-space and package of thin beds and the internal thin-bed contrast, is positive, constructive interference occurs. Destructive interference occurs when the combined contrast is negative. Maximum amplitude tuning occurs for thicknesses of thin-bed packages similar to the dominant pressure and shear wavelengths. Artifacts due to model periodicity are excluded by comparing periodic media with random models. By simulating moving oil/water contacts during production, where the oil layer is gradually being thinned, seismo-electromagnetic signals are proven very sensitive to oil/water contacts. An oil layer with a thickness of less than one percent of the dominant shear wavelength is still recognized. Grobbe, N., Van der Neut, J., Slob, E., Wapenaar, K., Almagro Vidal, C. and Drijkoningen, G.
Geophysical Prospecting, 64(2) p. 361-391. Abstract:Wavefield decomposition forms an important ingredient of various geophysical methods. An example of wavefield decomposition is the decomposition into upgoing and downgoing wavefields and simultaneous decomposition into different wave/field types. The multi-component field decomposition scheme makes use of the recordings of different field quantities (such as particle velocity and pressure). In practice, different recordings can be obscured by different sensor characteristics, requiring calibration with an unknown calibration factor. Not all field quantities required for multi-component field decomposition might be available, or they can suffer from different noise levels. The multi-depth-level decomposition approach makes use of field quantities recorded at multiple depth levels, e.g., two horizontal boreholes closely separated from each other, a combination of a single receiver array combined with free-surface boundary conditions, or acquisition geometries with a high-density of vertical boreholes. We theoretically describe the multi-depth-level decomposition approach in a unified form, showing that it can be applied to different kinds of fields in dissipative, inhomogeneous, anisotropic media, e.g., acoustic, electromagnetic, elastodynamic, poroelastic, and seismoelectric fields. We express the one-way fields at one depth level in terms of the observed fields at multiple depth levels, using extrapolation operators that are dependent on the medium parameters between the two depth levels. Lateral invariance at the depth level of decomposition allows us to carry out the multi-depth-level decomposition in the horizontal wavenumber–frequency domain. We illustrate the multi-depth-level decomposition scheme using two synthetic elastodynamic examples. The first example uses particle velocity recordings at two depth levels, whereas the second example combines recordings at one depth level with the Dirichlet free-surface boundary condition of zero traction. Comparison with multi-component decomposed fields shows a perfect match in both amplitude and phase for both cases. The multi-depth-level decomposition scheme is fully customizable to the desired acquisition geometry. The decomposition problem is in principle an inverse problem. Notches may occur at certain frequencies, causing the multi-depth-level composition matrix to become uninvertible, requiring additional notch filters. We can add multi-depth-level free-surface boundary conditions as extra equations to the multi-component composition matrix, thereby overdetermining this inverse problem. The combined multi-component–multi-depth-level decomposition on a land data set clearly shows improvements in the decomposition results, compared with the performance of the multi-component decomposition scheme. Smeulders, D.M.J., Grobbe, N., Heller, H.K.J. and Schakel, M.D. Vadose Zone Journal, 13(5) p. 1-7. Abstract:We designed and developed an experimental setup in which acoustic to electromagnetic (EM) wave conversions at interfaces can be measured. Theoretical results are obtained with an electrokinetic full-waveform theoretical model, where use was made of the Sommerfeld approach. Using bimodal samples, different fluid–solid interface effects and saturating fluids were investigated. The contrast between water and water-saturated porous glass samples is larger than the contrast between water and oil-saturated porous glass samples. The contrast between water and water-saturated Fontainebleau sandstone is larger than the contrast between oil and watersaturated Fontainebleau sandstone. Schoemaker, F.C., Grobbe, N., Schakel, M.D., De Ridder, S.A.L., Slob, E.C. and Smeulders, D.M.J. International Journal of Geophysics, 2012 p. 1-23. Abstract:We experimentally validate a relatively recent electrokinetic formulation of the streaming potential (SP) coefficient as developed by Pride (1994). The start of our investigation focuses on the streaming potential coefficient, which gives rise to the coupling of mechanical and electromagnetic fields. It is found that the theoretical amplitude values of this dynamic SP coefficient are in good agreement with the normalized experimental results over a wide frequency range, assuming no frequency dependence of the bulk conductivity. By adopting the full set of electrokinetic equations, a full-waveform wave propagation model is formulated. We compare the model predictions, neglecting the interface response and modeling only the coseismic fields, with laboratory measurements of a seismic wave of frequency 500 kHz that generates electromagnetic signals. Agreement is observed between measurement and electrokinetic theory regarding the coseismic electric field. The governing equations are subsequently adopted to study the applicability of seismoelectric interferometry. It is shown that seismic sources at a single boundary location are sufficient to retrieve the 1D seismoelectric responses, both for the coseismic and interface components, in a layered model. Fournier, A., Grobbe, N. and Demanet, L.
American Geophysical Union Fall Meeting, 2018 - Washington D.C., United States of America p. 1. Abstract:Coupled seismo-electromagnetism describes phenomena in (partially) fluid-saturated, porous media, in which elastic mechanical fields and electromagnetic fields are comparably strong, and coupled to each other. It provides a very complete picture that potentially significantly augments subterranean science and technology applications such as: fossil-fuel or geothermal exploration and production; near-surface characterization; groundwater study; and seismic electromagnetism. Notwithstanding this promising potential, there are formidable challenges, including: uncertainty of many material parameters and of initial and boundary conditions; and an enormous range of signal amplitudes in observations or realistic simulations. The governing equations comprise essentially: the Biot poroelastic wave equations for a solid-fluid composite; the Maxwell equations of electromagnetism; and terms representing the physical coupling of the former to the latter. Given the wide variety of behavior of the solutions of the equations, and wide range of spatiotemporal scales displayed by them, an analytical imperative is to nondimensionalize the equations e.g., by applying the Buckingham π theorem. Nondimensionalization will: remove spurious dependencies on, and incommensurabilities due to physical units; and identify candidate dimensionless parameters whose values may delineate solution-behavior regimes (analogously as the Reynolds number does in fluid dynamics), including spatial-scale regimes from lab up to global. A nondimensionalization cannot be unique; but to the best of our knowledge, none has been reported in the literature before for the coupled seismo-electromagnetic equations, so we will present one. We will define dimensionless parameters with meaningful physical interpretations and value ranges e.g., ratios of typical magnitudes of equation terms. We will also apply perturbation with respect to a selected small dimensionless parameter, in order to obtain reflection coefficients for coupled wave-medium interactions at surfaces of material spatial discontinuity. These coefficients provide the most straightforward description of such interactions, but explicit formulas for them tend to be impractically long and obscure, without a perturbation analysis such as we will derive. Viti, T.M. and Grobbe, N.
American Geophysical Union Fall Meeting, 2018 - Washington D.C., United States of America p. 3428-3432. Abstract:The Hawaiian Islands depend predominantly on local groundwater systems for fresh drinking water. 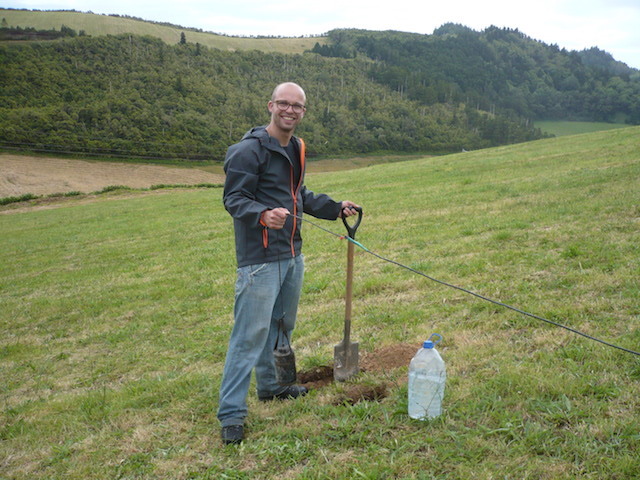 In order to improve our understanding of Hawaiian groundwater systems, the NSF funded ʻIke Wai project aims to formulate geologically and hydrologically accurate conceptual models of the subsurface, a task which can be informed significantly by geophysical data. Electromagnetic methods in particular, which have a strong sensitivity to fluid content and salinity, can provide valuable information about the distribution of fresh groundwater. In the Keauhou aquifer on the Island of Hawaiʻi, a sharp increase in head level observed at inland wells, suggests that the high-level, inland aquifer is distinct from the shallower coastal aquifer. The heights of these high-level heads, which in many cases exceed 100 m above mean sea level, imply that the aquifer may have an extensive depth (with thickness ranging in the kilometers), or may overlie an elevated impermeable formation, creating a perched system. To better understand the spatial distribution of fresh and saline groundwater in this aquifer, a small broadband magnetotelluric survey was conducted along a transect perpendicular to the Kona coast. In the processed data, impedance variances below 1 Hz and above 1 kHz were generally large, with the band 1 Hz to 1 kHz deemed most suitable for modeling and interpretation. Using the Stan modeling language, 1D Bayesian inversions were employed to estimate the survey’s depth of investigation and resolving power, suggesting that for the chosen band of data, resistivity parameters at depths of up to 2 km from the ground surface are reasonably well constrained by the data. Preliminary 2D Occam’s inversions were carried out using MARE2DEM, with both 1D Bayesian and 2D Occam inversion results displaying similar features. A resistive zone is observed to overly a strong conductor that appears at depths between 1 to 2 km, beyond which the Bayesian results suggest that parameter values are poorly constrained by the data. The two zones have resistivities that are reasonably consistent with published values for fresh and salt water saturated Hawaiian basalts, suggesting the MT data has provided a first mapping of the aquifer location. Grobbe, N., Slob, E.C. and Wapenaar, C.P.A. 78th EAGE Conference and Exhibition, 2016 - Vienna, Austria p. 1-5. Abstract:We here explore the application of interferometric principles to the coupled seismo-electromagnetic system. We consider 2D homogeneous space scenarios, and focus on one of the two seismo-electromagnetic propagation modes, the SH-TE mode, where horizontally polarized shear-waves are coupled to the transverse electric mode. We start by presenting the theory for retrieving seismo-electromagnetic Green’s function responses via interferometry by cross-correlation. Using explicit homogeneous space solutions, we numerically investigate the interferometric retrieval of an electric field response and a magnetic field response due to a seismic source. We first study the theoretically desirable circular source configuration, providing illumination from all sides, followed by a more realistic line source configuration, exploiting the interferometric far-field approximation. These two numerical examples prove for the selected source-receiver type combinations, that we can indeed retrieve correct dynamic seismo-electromagnetic 2D SH-TE responses using seismic boundary sources only. 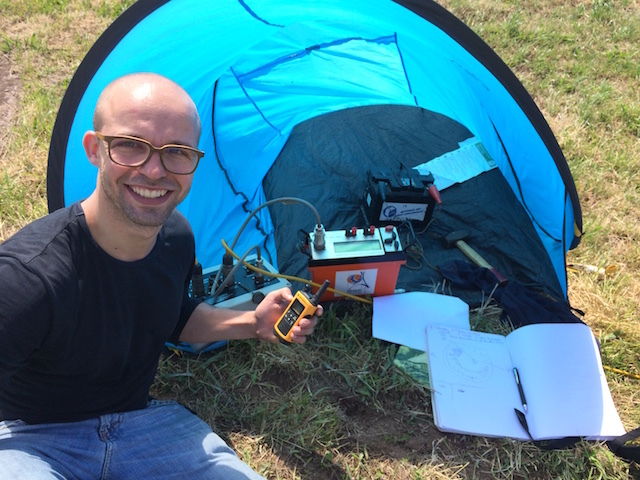 This is a promising result for the next step: applying 3D seismo-electromagnetic interferometry in the field. Japan Geoscience Union Meeting, 2015 - Chiba-city, Japan p. 1. Smeulders, D., Grobbe, N., Heller, K., and Schakel, M.
American Geophysical Union Fall Meeting, 2014 - San Francisco, USA p. 1. Abstract:The seismoelectric effect where acoustic/seismic waves are converted into electromagnetic waves and vice versa, is of importance for hydrocarbon exploration as it is complementary to the conventional seismic surveys. Also for the detection of orebodies (for example massive sulfides), seismoelectric techniques are promising. For hydrological purposes, seismoelectric techniques can provide us with information as well, mapping for example water tables and water-retentive layers. Also for mapping of water-bearing strata beneath glaciers or monitoring of ice fracturing, seismoelectric methods are argued to be very powerful as they can distinguish between conductive and non-conductive layers that have similar acoustic impedances and thus cannot be mapped in conventional seismic surveys. We designed and developed an experimental setup in which acoustic to electromagnetic (EM) wave conversions at interfaces can be measured. Theoretical results are obtained with an electrokinetic full-waveform theoretical model, where use was made of the Sommerfeld approach. Using bimodal samples, different fluid-solid interface effects and saturating fluids were investigated. The contrast between water and water-saturated porous glass samples is larger than the contrast between water and oil-saturated porous glass samples. The contrast between water and water-saturated Fontainebleau sandstone is larger than the contrast between oil and water-saturated Fontainebleau sandstone. These data are shown to be in good agreement with theoretical predictions on the basis of the Biot-Pride theory. Society of Exploration Geophysicists Annual Meeting Technical Program Expanded Abstracts 2014 - Denver, USA p. 3428-3432. Abstract:Increasing industrial and societal challenges demand a continuous need for improved imaging methods. In recent years, quite some research has been performed on using seismoelectric phenomena for geophysical exploration and imaging. Like the other methods, the seismoelectric technique also has its drawbacks. Besides the fact that the physical phenomenon is very complex, one of its main challenges is the very low signal-to-noise ratio of the coupled signals, especially the second-order interface response fields. From seismics, it is well-known that anonamously high amplitudes can arise due to amplitude-tuning effects which can occur when a seismic signal travels through a package of thin-layers with appropriate amplifying thickness. Using numerical seismoelectric wave propagation experiments through packages of thin-beds, we show that thin-bed geological settings can improve the signal-to-noise ratio of the interface response fields. Whether a certain package of thin-beds results in a net strengthening or weakening of the signal, is determined by the contrast in and the order of the coupling coefficients of the different thin-layer media. Formulated differently, we show that the seismoelectric method is sensitive to the medium parameters of thin-bed geological structures far below the seismic resolution, and that due to natural strengthening of the seismoelectric interface response signal, the method might be already suitable for certain geological settings. Grobbe, N., Hunziker, J.W., and Slob, E.C. Society of Exploration Geophysicists Annual Meeting Technical Program Expanded Abstracts 2014 - Denver, USA p. 2072-2077. Abstract:The seismoelectric effect can be of importance for hydrocarbon exploration as it is complementary to conventional seismics. Besides enabling seismic resolution and electromagnetic sensitivity at the same time, the seismoelectric method can also provide us with additional, high-value information like porosity and permeability. However, very little is still understood of this complex physical phenomenon. Therefore, it is crucial to be able to perform numerical modeling experiments to carefully investigate the effect and the parameters that play a role. Over the last couple of years, several seismoelectric laboratory experiments have been carried out in an attempt to validate the underlying theory of the phenomenon and to better understand this complex physical phenomenon. We have recently extended our analytically based, numerical seismoelectric modeling code ’ESSEMOD’ to be able to model seismoelectric wave propagation in arbitrarily layered Earth geometries with fluid / porous medium / (fluid) interfaces. In this way, we are capable of effectively simulating full seismoelectric wave propagation, i.e. all existing seismoelectric and electroseismic source-receiver combinations, in typical laboratory configura- tions. We present the underlying theory that is required for the extension towards arbitrary fluid / porous medium / (fluid) geometries and an effective way to incorporate this in a general seismoelectric layered Earth modeling code. We then validate the underlying global reflection scheme by comparing it with an independently developed layered Earth modeling code for purely electromagnetic fields. The results show a perfect match in both amplitude and phase, indicating that ESSEMOD is correctly modeling the electromagnetic parts of the seismoelectric wave propagation in horizontally layered media with fluid / porous medium / fluid transitions. We finalize with a seismoelectric reciprocal modeling experiment, proving that also the full seismoelectric wave propagation through fluid / porous medium transitions is modeled consistently. Grobbe, N., Van der Neut, J., Almagro Vidal, C., Drijkoningen, G., and Wapenaar, K.
76th EAGE Conference and Exhibition, 2014 - Amsterdam, the Netherlands p. 1-5. Abstract:Separation of recorded wavefields into downgoing and upgoing constituents is a technique that is used in many geophysical methods. The conventional, multi-component (MC) wavefield decomposition scheme makes use of different recorded wavefield components. In recent years, land acquisition designs have emerged that make use of shallow horizontal downhole sensor arrays. Inspired by marine acquisition designs that make use of recordings at multiple depth levels for wavefield decomposition, we have recently developed a multi-depth level (MDL) wavefield decomposition scheme for land acquisition. Exploiting the underlying theory of this scheme, we now consider conventional, multi-component (MC) decomposition as an inverse problem, which we try to constrain in a better way. We have overdetermined the inverse problem by adding an MDL equation that exploits the Dirichlet free-surface boundary condition. To investigate the successfulness of this approach, we have applied both MC and combined MC-MDL decomposition to a real land dataset acquired in Annerveen, the Netherlands. Comparison of the results of overdetermined MC-MDL decomposition with the results of MC wavefield decomposition, clearly shows improvements in the obtained one-way wavefields, especially for the downgoing fields. Society of Exploration Geophysicists Annual Meeting Technical Program Expanded Abstracts 2013 - Houston, USA p. 1847-1851. Abstract:We have developed an analytically based, energy flux-normalized numerical modeling code (ESSEMOD), capable of modeling the wave propagation of all existing ElectroSeismic and SeismoElectric source-receiver combinations in horizontally layered configurations. We compare the results of several of these modeled source-receiver combinations in a homogeneous medium with explicitly derived homogeneous space Green’s function solutions, in order to be able to validate the results of ESSEMOD both in arrival times and amplitudes. Especially the amplitudes are important due to the fact that the main reason seismoelectric phenomena are not yet used in industry, are the weak amplitudes of these phenomena. Here we show that ESSEMOD correctly models the wave propagation of components of the electric field generated by different components of bulk forces, as well as the particle velocity fields generated by a bulk force source and an electric current source. We are capable of validating both amplitudes and arrival times of the results of ESSEMOD for all electroseismic and seismoelectric source-receiver combinations in homogeneous media. Herewith, we reduce uncertainty in our modeling results (also for heterogeneous scenarios) and can get better insights in which parameters affect the amplitudes most. In addition, we show that ESSEMOD is capable of modeling reciprocal source-receivers combinations correctly, implicitly indicating correct modeling of both geometrical configurations (source located above or below the receiver level). ESSEMOD can now be used for comparison with and validation of existing seismoelectric layered earth numerical modeling codes. Afterwards, ESSEMOD can be used for validation of existing seismoelectric finite-element and finite-difference codes. Van der Neut, J.R., Almagro Vidal, C., Grobbe, N., and Wapenaar, C.P.A. 75th EAGE Conference and Exhibition, 2013 - London, UK p. 1-5. Abstract:We present a novel method to transform seismic data with sources at the surface and receivers above and below a selected target zone in the subsurface into virtual data with sources and receivers located at the initial receiver locations. The method is based on inverting a series of multidimensional equations of the convolution- and the correlation-type. The required input data can be computed from surface seismic data with a new iterative scheme that is currently being developed. The output data contains virtual sources that illuminate the target not only from above (as in the original data), but also from below, facilitating the needs of seismic imaging and inversion in an optimal way. The method is nonlinear in the sense that all internal multiples are correctly accounted for and true amplitude in the sense that the virtual sources are forced to inherit uniform radiation patterns even though the overburden is strongly heterogeneous. Geophysical Research Abstracts Vol. 14, EGU2012-10636, Vienna, Austria p. 1. Abstract:We present a numerical code (ESSEMOD) for modeling electroseismic and seismoelectric wave propagation in horizontally layered configurations. As the basis for the code, we have first split the SH-TE mode from the P- SV-TM mode and used an energy flux-normalized system of two-way equations decomposed into upgoing and downgoing fields. Using this flux-normalized system enables the usage of the transpose of the composition matrix as the inverse of the composition matrix (being the decomposition matrix). This leads to a faster and computation- ally less expensive numerical code. Furthermore, flux-normalization leads to a more stable numerical scheme due to the fact that the numerical inverse of the composition matrices can be avoided. The mode splitting is achieved by decoupling the coupled system of 12 governing equations into a coupled system of 8 equations, describing the P-SV-TM propagation mode, and an independently coupled system of 4 equations, describing the SH-TE propaga- tion mode. At the source level, the two-way wavefields are decomposed into upgoing and downgoing wavefields, which are extrapolated via one-way wavefield extrapolation operators in the horizontal wavenumber-frequency domain. The code makes use of global reflection coefficients, leading to an efficient numerical scheme due to the fact that explicit calculation of the scattering matrices is not required. The recursive scheme requires a one-way trip from the bottom interface up to the source level and a similar one-way trip from the top interface down to the source level, where the two are connected by satisfying the pertaining boundary conditions. Because the receiver is known when the computations start, the field at the receiver level is updated when the recursive scheme passes the receiver level and moves on to the source level. The upgoing and downgoing wavefields generated at the source level, are extrapolated to the receiver layer. Here, the wavefields are multiplied with the corresponding global re- flection matrices to obtain the full upgoing and downgoing wavefields at the receiver level. The two seismoelectric propagation modes are modeled independently. Before the inverse Fourier-Bessel transformation can be carried out at the receiver level, wavefield composition takes place and here the SH-TE and P-SV-TM propagation modes are combined, resulting in two-way wavefields due to two-way sources. The resulting Fourier-Bessel transformation is then computed. The sources and receivers can be placed anywhere in the model, even on interfaces. Furthermore, modeling of all existing seismoelectric (electroseismic) two-way source-receiver combinations is possible. Several modeling results will be presented, placing the sources and receivers at different depth levels. Placing the sources and/or receivers in the near-fields, enables us to study the interface waves. Acknowledgements: This research was funded as a Shell-FOM (Foundation for Fundamental Research on Matter) project within the research program ’Innovative physics for oil and gas’. Grobbe, N., Viti, T.M., Okuhata, B.K., Seo, Y., Lee, J., El-Kadi, A.I., Jacobs, G.
Abstract: The State of Hawai‘i consists of a chain of volcanic islands in the middle of the Pacific Ocean. Given this isolated setting, the population of Hawai‘i is dependent on its own water resources. Due to the volcanic nature of the islands, the geology is very complex, and understanding the groundwater systems extremely challenging. The NSF EPSCoR ‘Ike Wai Project is a multi-disciplinary project, aimed to improve our knowledge of the Hawaiian groundwater systems, to ensure a sustainable water future for the State of Hawai‘i. The project integrates geophysics, geology, geochemistry, microbiology, groundwater modeling, indigenous knowledge, economics and management, as well as data science. This talk will primarily focus on the role of hydrogeophysics in the project, and how it is integrated to provide value and crucial information for groundwater modeling and analyses, having an impact far beyond its own discipline. We will highlight the importance of integrating hydrogeophysics and groundwater modeling in the grand scheme of water management in volcanic island settings, presenting important scientific questions being addressed as well as critical hydrogeologic features to identify and consider. We will discuss challenges and limitations of various hydrogeophysical techniques in volcanic settings, as well as complementarity of methods and new ways to overcome these challenges. Furthermore, we will illustrate the above with both synthetic and field data examples for the Hawaiian volcanic island setting. Oyama, T., Zhou, J., Grobbe, N., Jacobs, G., Garmire, D.G. Abstract: Water quality is of the utmost importance to Hawaii as the entire state depends on the groundwater from the islands. Constant monitoring of the water has not yet been implemented. Currently, if the water becomes contaminated, the pollutants are not detected immediately and puts the health of people, animals, and plants at risk. One goal of the ‘Ike Wai project is to model Hawaii’s freshwater to prevent future problems such as shortage and contamination. This project studies the advancement of sensor technology for widespread, inexpensive, and long-term water monitoring. Points of study include the impact of pumping on the sustainable yield of the freshwater aquifers and conductivity at different depths that may indicate the conductivity levels of the surrounding rock. The conductivity levels of the water can provide constraints on petrophysical relationships between a bulk electrical conductivity value obtained with geophysics and rock properties. Flow rates and directions are of interest for extracting Darcy flow velocities and time lapse measurements. The system developed is called the Downwell Remotely Operated Platform (DROP) module. The module integrates a salinity, biofluorescence, temperature, and accelerometer/gyroscope sensor. The salinity sensor is fabricated in house and all the other sensors are made with off the shelf chips to reduce the cost. The biofluorescence sensor uses fluorescence spectroscopy to find bio-contaminants in the water. The accelerometer/gyroscope sensor provides direction and can help determine the flow rate. The module is powered by a lithium ion battery and PV solar panel. It uses a Raspberry Pi Zero W for wireless and remote sensing. We will discuss the details of the DROP module and how the data collected can help illustrate Hawaii’s groundwater model. We will elaborate on how the data ties into other aspects of the ‘Ike Wai project such as the geophysics aspect. The DROP module presents a platform to start ground-truthing, validating hydrogeophysical images, and constraining inversion results. Furthermore, this talk will go over how the DROP module system can be adapted for other applications and can be altered to incorporate other measurements. Viti, T.M., and Grobbe, N.
7th International Conference on Environmental Future (7ICEF): Humans and Island Environments. 2018 - Honolulu, HI, United States of America p. 1. Abstract: The islands of Hawai‘i, like many other Pacific islands, are solely dependent on their own fresh water resources. The co-play of increasing population growth and climate change forms a unique challenge for Hawai‘i’s sustainable fresh water future. Combined with the tremendous geological and hydrological complexity of volcanic islands, this results in the need for an improved understanding of Hawai‘i’s groundwater resources, flow paths, and aquifer connectivity. To do so, we require geophysical techniques to characterize the Earth’s subsurface in a non-destructive fashion. Electromagnetic geophysical sounding methods such as the magnetotelluric technique (MT), aim to provide a map of the subsurface distribution of electrical resistivity. The electrical resistivity of rocks is a function of porosity, fluid saturation, and rock and fluid conductivity. By mapping its subsurface distribution, we can indirectly infer the spatial extent of groundwater resources. MT is a so-called passive measuring technique with limited environmental footprint, which makes use of naturally induced electromagnetic fields generated by fluctuations in the Earth’s magnetic field. Here, we study the potential of MT for delineating aquifer controlling, confining and impounding geological structures. These structures can produce anomalous groundwater well-heads, control flow velocities, and can cause lack of aquifer connectivity and recharge. Hence, increasing our knowledge of these structures is crucial for understanding sustainable yield, as well as for informing various management and stakeholder decisions. This work is part of the multi-disciplinary NSF-EPSCoR ‘Ike Wai project. ‘Ike Wai - EPSCoR State Conference’2018 - Honolulu, HI, United States of America p. 1. Staring, M.,Grobbe, N., Van der Neut, J., and Wapenaar, K.
79th EAGE Conference and Exhibition, 2017 - Paris, France p. 1-5. Abstract: We compare the coupled Marchenko equations without free-surface multiples to the coupled Marchenko equations including free-surface multiples. When using the conventional method of iterative substitution to solve these equations, a difference in convergence behaviour is observed, suggesting that there is a fundamental difference in the underlying dynamics. Both an intuitive explanation, based on an interferometric interpretation, as well as a mathematical explanation, confirm this difference, and suggest that iterative substitution might not be the most suitable method for solving the system of equations including free-surface multiples. Therefore, an alternative method is required. We propose a sparse inversion, aimed at solving an under-determined system of equations. Results show that the sparse inversion is indeed capable of correctly solving the coupled Marchenko equations including free-surface multiples, even when the iterative scheme fails. Using sparsity promotion and additional constraints, it is expected to perform better than iterative substitution when working with incomplete data or in the presence of noise. Also, simultaneous estimation of the source wavelet is a potential possibility. Grobbe, N., Maas, P.J., Slob, E.C., and Mulder, W.A. Abstract: When a mechanical wavefield propagates through a porous, fluid-filled medium, a complex physical phenomenon called the seismoelectric effect can occur. Due to the presence of an electrical double layer at the microscale, coupling between the mechanical wavefield and electromagnetic fields can occur. Pride (1994) has developed a set of governing equations that describes the seismoelectric effect using Biot’s poroelasticity equations coupled to Maxwell’s electromagnetic equations. Coupling effectively takes place at two locations: 1) Inside the seismic wavefield, copropagating with the seismic wave velocity and therefore referred to as the coseismic field. This field provides us with local information in the vicinity of the receivers. 2) At locations where contrasts in medium parameters occur (for example interfaces) an independently diffusing electromagnetic field is generated, referred to as the interface response field or seismoelectric conversion. The seismoelectric method tries to take advantage of this subsurface coupling as a geophysical tool for exploration or monitoring purposes, as well as for borehole applications. Besides providing us with seismic resolution and electromagnetic fluid–sensitivity at the same time, several studies have also shown that seismoelectric fields can provide us with supplemental information about porosity, permeability and pore-fluid properties such as viscosity. The seismoelectric method can potentially be used for the detection and monitoring of oil/water contacts, several (near–)borehole applications and the monitoring of aquifers. However, the seismoelectric effect is described by a combination of many (often mutually related) subsurface parameters. Therefore, inversion of seismoelectric data for a specific parameter is costly and solving for such a parameter uniquely might be even impossible. By carrying out sensitivity analyses prior to inversion, we can investigate whether the measured fields are actually sensitive to the parameter(s) of interest. In addition, sensitivity analyses can provide information about the optimal acquisition design or help us investigating time–lapse perturbations. We will start by explaining the theory of resolution functions using a seismoelectric example. We will derive the seismoelectric resolution function for inversion for a bulk density contrast. We will compute this resolution function as the least-squares solution to the normal equation. We will demonstrate the effectiveness of this method by first carrying out a purely electromagnetic sensitivity analysis for a point perturbation in conductivity. These results will be compared with literature results. As a next step, we investigate the electromagnetic sensitivity to point scatterers above and below highly conductive layers. Finally, we will present the results of the fully–coupled seismoelectric sensitivity analysis for a bulk density contrast, using single–frequency multicomponent line data. Maas, P.J.,Grobbe, N., Slob, E.C., and Mulder, W.A. 77th EAGE Conference and Exhibition, 2015 - Madrid, Spain p. 1-5. Abstract:For multi-parameter problems, such as the seismoelectric system, sensitivity analysis through resolution functions is a low-cost, fast method of determining whether measured fields are sensitive to certain subsurface parameters. We define a seismoelectric resolution function for the inversion of a bulk density perturbation. The synthetic data and Green’s functions required to construct the resolution function are computed using the seismoelectric modelling code ESSEMOD. First, we consider the purely electromagnetic problem with a conductivity perturbation at a single point in an isotropic homogenous half-space. The result is nearly identical to a published result based on analytical Green’s functions. It correctly maps the position of the scatterer. Next, we perform an electromagnetic sensitivity analysis for the case of a layered background medium. Again, the resolution function is capable of correctly mapping the scatterer when it is above as well as below a layer of increased conductivity; although in the latter case with less resolution. Finally, we generate multi-component synthetic data with our forward modelling code and compute the seismoelectric resolution function for inversion of a bulk-density perturbation. We find that the seismoelectric system is sensitive to a perturbation in bulk density and that the position of the perturbation can be correctly recovered. Grobbe, N. and Slob, E.
Abstract: The seismoelectric effect might help improving our knowledge of the subsurface. This complex physical phenomenon can be described by Biot’s poroelasticity equations coupled to Maxwell’s electromagnetic equations. Besides simultaneously offering seismic resolution and electromagnetic sensitivity, the coefficient coupling these two types of fields can in principal provide us with direct information on important medium parameters like porosity and permeability. Two types of seismoelectric coupling can be distinguished: 1) localized coupling generating an electromagnetic field that is present inside the seismic wave and travels with its velocity, referred to as the coseismic field 2) An independent electromagnetic field diffusing with electromagnetic velocity, referred to as the seismoelectric conversion, providing us with information at depth. One of the major challenges of seismoelectrics is the very weak signal-to-noise ratio of especially the seismoelectric conversion. In order to make seismoelectrics applicable in the field, we need to find ways to improve the signal-to-noise ratio of this second order effect. Can nature help us? It is well-known that a seismic wave travelling through a package of thin-beds, can experience amplitude-tuning effects that result in anomalously high amplitudes for the seismic signal. Can similar enhancing signal effects occur for seismoelectric phenomena? Using our analytically based, numerical modeling code ESSEMOD (ElectroSeismic and Seismoelectric Modeling), we investigate what effects thin-beds can have on the seismoelectric signal, thereby focusing especially on the seismoelectric conversion. We will highlight the factors that play a role in the possible enhancement of the seismoelectric signal-to-noise ratio by thin-beds. We show that the seismoelectric method is sensitive to changes in medium parameters on a spatial scale that is much smaller than the seismic resolution. Acknowledgements: This research was funded as a Shell-FOM (Foundation for Fundamental Research on Matter) project within the research program ’Innovative physics for oil and gas’. Slob, E. and Grobbe, N.
Abstract: The theory of coupled elastic waves and electromagnetic fields in porous media exists for two decades. Several modeling codes have been developed and some field work has been carried out with mixed success. Modeling the so-called electroseismic and seismo-electromagnetic wavefields is tricky because of the strong elastic fields generated by mechanical sources and strong electromagnetic fields generated by electromagnetic sources, while the coupled fields have relatively small amplitudes. A second difficulty is the fact that the elastic field is essentially a wavefield, while the electromagnetic field is a diffusive field. The slow P-wave is usually also a diffusive field depending on the frequency bandwidth of the data. On the other hand, for porous soils and rocks, laboratory measurements have been carried out to experimentally validate the current theoretical model and to some extent this has been successful. To be able to understand measured data it is crucially important that we have good control on the accuracy of modeled data. Today we don’t have this control, which makes it hard to judge the quality of the modeled data and trust the experimental validation of the theory. It is therefore important that exact solutions are found to validate modeling codes in simple configurations. These modeling codes can then numerically validate the theory by matching the results obtained in laboratory or field experiments. The simplest configuration is the homogeneous space and we show exact solutions for the governing equations for point sources and point receivers. These Green’s functions are obtained for any type of point source and any type of receiver. We reduce the coupled equations to two scalar equations for the electric field and the particle velocity vectors. Solutions for longitudinal and transverse waves are obtained separately and these are combined to obtain the Green’s functions for the electric field and the particle velocity, from which the solutions for all other fields are found. We show numerical examples of the fields that can be measured in the field. Grobbe, N., Van der Neut, J.R., and Almagro Vidal, C.
Society of Exploration Geophysicists Annual Meeting Technical Program Expanded Abstracts 2013 - Houston, USA p. 1. Abstract: We present a new approach to apply wavefield decomposition, illustrated for an energy flux-normalized elastodynamic case. We start by considering a situation where two horizontal boreholes are closely separated from each other. By recording only the particle velocities at both depth levels (for example with conventional 3-component geophones) and expressing the one-way wavefields at one depth level in terms of the fields at the other depth level, an inverse problem can be formulated and solved. This new approach of multi-depth level(MDL) wavefield decomposition is illustrated with a synthetic 2D finite difference example, showing correct one-way wavefield retrieval. We then modify the methodology for a special case with a single receiver array just below a free surface, where the problem is naturally constrained by the (Dirichlet) boundary condition at the free-surface. Again, it is shown that correct elastodynamic wavefield decomposition takes place, for both P- and S-waves. Grobbe, N., Thorbecke, J.W., and Slob, E.C. Dutch interpore meeting, 2012 - Rijswijk, The Netherlands p. 1. Abstract: We present 3D SH-TE layered-Earth modeling results with ESSEMOD. Grobbe, N., Schoemaker, F.C., Schakel, M.D., De Ridder, S.A.L., Slob, E.C., and Smeulders, D.M.J. Abstract: The investigations encompass both experimental and theoretical studies of coupling between electromagnetic and poroelastic fields. First, we experimentally investigate the streaming potential (SP) coefficient. This coefficient gives rise to the coupling of mechanical and electromagnetic fields. The normalized experiments and the theoretical amplitude results of this dynamic SP coefficient are in good agreement with each other. In addition, measurements of the dynamic permeability correlate well with the computed amplitude and phase as predicted by the model. Second, we have formulated a full-waveform electrokinetic wave propagation model. The model predictions are compared with laboratory measurements of a seismic wave of frequency 500kHz that generates electromagnetic signals. We hereby only focus on the coseismic fields and hence neglect the interface response. The measured coseismic electric field is accurately predicted by the model in terms of traveltime, waveform and amplitude, confirming the electrokinetic theory that underlies this model. Third, a novel application of electrokinetic prospecting is studied by computer simulations; seismoelectric interferometry. In seismics and electromagnetics, the principle of interferometry has already been proven to be beneficial for imaging purposes. Interferometry using coupled seismic and electromagnetic waves for imaging purposes, can provide both seismic resolution and information about the pore fluid content. A well-known challenge in seismoelectric field surveys is the weak interface response. Us- ing strong sources is one of the suggested solutions. However, this is not always possible and therefore it would be desirable to be able to use the principle of interferometry and hence to replace these strong sources by receivers. Interferometry implicitly stacks over many background sources, thus strong signals can possibly be obtained by recording sufficiently long to overcome the weak signal-to-noise ratio. Numerical examples show that in order to retrieve the 1-D coseismic and interface responses in a layered model correctly, the presence of only seismic sources at a single boundary location is sufficient. Acknowledgements: The research was carried out at Delft University of Technology. 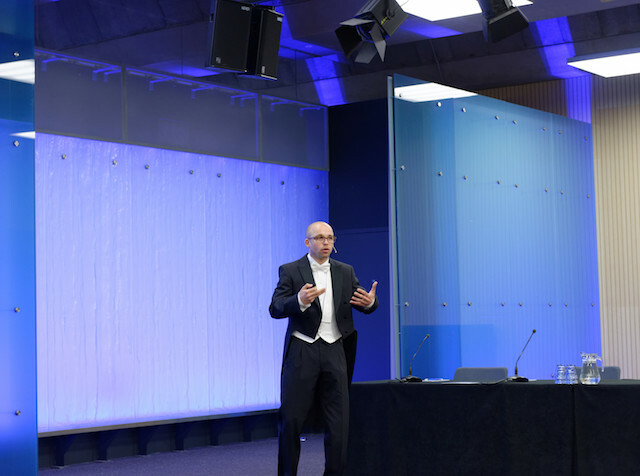 It was partly performed un- der the financial support of Shell-FOM (Foundation for Fundamental Research on Matter) within the research programs ’The physics of fluids and sound propagation’ and ’Innovative physics for oil and gas’. Grobbe, N., Slob, E.C., and Wapenaar, C.P.A. Seismoelectric Workshop, Leibniz Institute for Applied Geophysics, 2011 - Hannover, Germany p. 1. Abstract: This poster presents a brief introduction to correlation-imaging with seismo-electromagnetic waves. Abstract: In this thesis, I study coupled poroelastic waves and electromagnetic fields in layered media. The focus is two-fold:1. Increase the theoretical and physical understanding of the seismo-electromagnetic phenomenon by analytically-based numerical modeling.2. Investigate the potential of seismo-electromagnetic interferometry.After presenting the governing equations that form the basis of the theoretical framework, I capture this system into a matrix-vector representation of the wave equation. I first use literature eigenvector sets, which I normalize with respect to power-flux. I then derive new, alternative power-flux normalized eigenvector sets that I prove to be numerically more stable and accurate. The eigenvector sets form the basis of the analytically-based numerical modeling code `ESSEMOD' that I developed to model seismo-electromagnetic wave/field propagation/diffusion in layered-Earth media. The alternative eigenvector set models scenarios with no seismo-electromagnetic coupling correctly, where the literature eigenvector sets fail. In addition, the alternative set properly deals with scenarios where both small amplitude signals and large amplitude signals occur in the record, whereas the literature eigenvector sets result in noise levels masking the small events. The same holds for scenarios with a small seismo-electromagnetic coupling coefficient. I design an effective global reflection scheme that properly describes the primary and multiple reflections in the models. I implement the correct boundary conditions to account for scenarios with a free-surface, and also for scenarios containing fluid/porous medium/fluid transitions. To transform all the seismo-electromagnetic source-receiver combinations in a numerically effective way back from the horizontal wavenumber-frequency domain to the space-frequency domain, I derive and implement explicit Fourier-Bessel transformations.I then validate the developed modeling code in numerous ways. First of all, I compare the results of seismo-EM layer-code modeling in a homogeneous medium with explicit homogeneous space Green's function expressions. This comparison provides a clear validation that the layer-code models the dynamic responses in homogeneous scenarios correctly. Next, I check numerical consistency by carrying out reciprocity checks. I study homogeneous space models, models containing a free-surface and models with interfaces.As a next step, I validate the modeling results of seismo-EM layer-code modeling for typical seismo-electromagnetic laboratory configurations, i.e. models containing fluid/porous medium/fluid transitions. I first compare the purely electromagnetic part of the seismo-EM layer-code with an independently developed purely electromagnetic layered-Earth code. The results match perfectly in both phase and amplitude for full transmission and pure reflection experiments, as well as for a combination of both. I then carry out a seismo-electromagnetic reciprocity test for a fluid halfspace overlying a porous medium halfspace, proving that the coupled poroelastic and electromagnetic fields are modeled consistently and yield the expected results.As a final validation step, I compare ESSEMOD with an independently developed seismo-electromagnetic layered-Earth modeling code. The results display an almost perfect match in both phase and relative amplitudes, and a constant amplitude correction factor of 4 needs to be applied to let the absolute amplitudes match.I then carry out a small feasibility test to study the potential of the seismo-electromagnetic effect for exploration purposes. I investigate different source-receiver combinations for the same model, and focus on the signal strength recorded at different distances from the target depth level. I conclude that for the source-receiver combinations studied, the electric field due to a volume injection monopole source, as well as the magnetic field due to a seismic bulk force source, yield the strongest converted signals. The receiver-distance from the target of interest plays an important role in the signal measurability. The closer the receivers to the target, the higher the signal strengths. However, when the receivers are located too close to the target, the coseismic reflected fields can mask the interface response fields that we are mainly interested in.Next, I study if nature itself can help us to overcome the very low signal-to-noise ratio of seismo-electromagnetic converted fields, by investigating the effects of thin-bed geological structures on the seismo-electromagnetic signal. To investigate the effects of bed-thinning on the seismo-electromagnetic interference patterns, I numericallysimulate seismo-electromagnetic wave propagation through horizontally layered media with different amounts and thicknesses of thin-beds. I demonstrate seismo-electromagnetic sensitivity to changes in medium parameters on a spatial scale much smaller than the seismic resolution. By simulating moving oil/water contacts duringproduction, where the oil layer is gradually being thinned, seismo-electromagnetic signals are proven very sensitive to oil/water contacts.I now explore the application of interferometric techniques to the seismo-electromagnetic system, which might eventually lead to an improved signal-to-noise ratio of the weak converted fields.I derive the theory for interferometric retrieval of 2D SH-TE seismo-electromagnetic Green's functions.Using both a circular source configuration and a line source configuration, I show that it is possible to correctly retrieve the dynamic seismo-electromagnetic 2D SH-TE response in a homogeneous medium, using seismic boundary sources only. Using seismo-EM layer-code data, I then show that it is also possible to correctly retrieve the direct shear wave-related causal coseismic field in a homogeneous medium, in both phase and amplitude. To obtain a perfect match in absolute amplitudes, I apply a single linear scaling factor. I finally carry out interferometric experiments in a model containing a single interface at 800 m depth, proving that it is possible to correctlyretrieve all 2D SH-TE causal seismic-related direct and reflected coseismic fields, as well as interface response fields, by cross-correlation interferometry, using seismic boundary sources only.These results are promising for the application of 3D seismo-electromagnetic interferometry using seismo-EM layer-code modeling, and later on, in the field.Next, I present an alternative way to effectively decompose fields into their up- and downgoing components and different field types, using recordings at multiple depth levels. I present the theory of this MDL decomposition scheme, followed by successful decomposition of synthetic elastodynamic data sets. 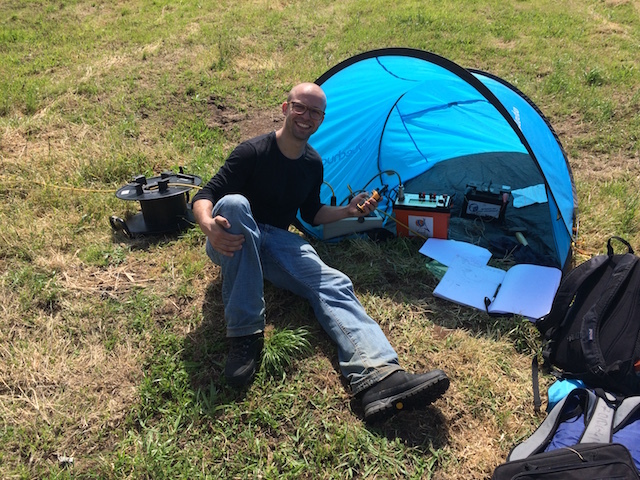 I additionally study the implications of laterally-varying media on the horizontal wavenumber-frequency domain MDL decomposition scheme.I demonstrate successful decomposition, using an acoustic approximation and applying a combined multi-component / MDL decomposition approach, of a field data set recorded in Annerveen, in the North of the Netherlands. I address how to effectively use the MDL decomposition scheme in a unified fashion, applied to all wave phenomena including seismo-electromagnetic phenomena.I then make a step towards seismo-electromagnetic inversion, presenting an effective way to carry out a seismo-electromagnetic sensitivity analysis using resolution functions. I start by explaining the theory of resolution functions using a seismo-electromagnetic example. I define the seismo-electromagnetic resolution function for inversion for a bulk density perturbation. I demonstrate the effectiveness of this method by first carrying out a purely electromagnetic sensitivity analysis for a point perturbation in conductivity, located in an isotropic homogeneous half-space. These results are compared with literature results based on analytical homogeneous space Green's function expressions. The result using the seismo-EM layer-code is nearly identical to the literature result. The position of the scatterer is correctly resolved. At the end of this section, I present the results of the fully-coupled seismo-electromagnetic senstivity analysis for a bulk density contrast for a specific source-receiver combination, using single-frequency multi-component line data. I show that the coupled seismo-electromagnetic system is sensitive to a perturbation in bulk density and that the position of the perturbation can be correctly recovered.I finalize this thesis by discussing potential seismo-electromagnetic applications, as well as by providing a brief outlook for future research. Grobbe, N., Revil, A., Zhu, Z. and Slob, E.
John Wiley and Sons Ltd., West Sussex, UK. Abstract: This book is currently still under development. The editors are Niels Grobbe (chief-editor), Andre Revil, Zhenya Zhu, and Evert Slob.